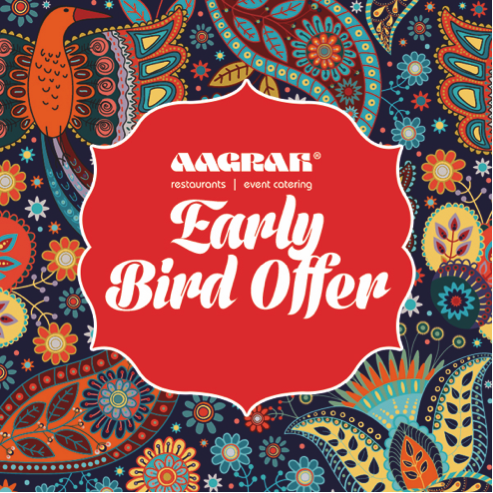 The Early Bird Offer is now available at Chapel Allerton! Enjoy the great authentic Aagrah taste for even less! Order 2 starters and 2 main dishes and receive the least expensive main dish for free!! Order 4 starters and 4 main dishes and receive the least expensive 2 dishes free!! This offer is valid Monday – Friday from 5:30pm – 7:00pm. Orders MUST be placed before 7pm. Not valid throughout December and when the Christmas Menus are in operation. Not valid for parties of 8 people and more. Cannot be used in conjunction with any special offers or promotions. Not valid on fixed price buffets. The management reserves the right to amend, withdraw or decline the offer without notice and without compensation. In any case of dispute the manager’s decision is final.